The global economy has transformed significantly since the establishment of the Multilateral Development Banks (MDBs), mainly due to globalization and the evolution of country-driven development strategies. These transformations have led to the general acceptance of private sector and private international finance as key to economic development. Thus, MDBs will need to form partnerships with the private sector to catalyze private finance for development well into the 21st century. While initially focused on providing funding, the MDBs have evolved into institutions that provide cutting edge knowledge products about development at the global, regional, country, and local levels, and help build capacities to manage interrelated development processes. Traditionally, the MDBs, have focused on the implications of global policies in developing countries in areas such as trade, debt relief, poverty alleviation, economic growth, and environmental protection by working directly with governments and government agencies. The MDBs play a seminal role in promoting economic and financial stability, and advocate for global public goods in several international fora including the Group of 20 (G-20) and Group of 7 (G-7). Consequently, the MDBs play a vital and well-suited role to help countries achieve the Sustainable Development Goals (SDGs) and address the challenges posed by the 2030 Agenda. The attainment of the SDGs requires a mountain of resources that cannot be gathered through traditional sources of funding, be it Official Development Assistance or MDBs’ resources. Trillions of dollars are required annually to reach the SDGs by 2030. This is well beyond the ability of international financial institutions, including MDBs. To implement the 2030 Agenda, the role of MDBs must shift from transferring resources to mobilizing them. Hence, private sector financing and investments are vital for the implementation of the 2030 Agenda and achievement of the SDGs. The role of the private sector has gained momentum, and a core challenge for the MDBs is to open up opportunities for them. The MDBs are adept at serving as intermediaries between countries that need to invest in development projects and private finance. They have a sterling track record in aiding countries enhance their national capabilities for project and public investments, and they also provide assurance that disputes are settled in an impartial manner. The MDBs could bring the private financial sector on board through an ex-ante and ex-post engagement as financier or co-financier of projects. Both the ex-ante and ex-post approaches entail innovative and new types of partnerships between the MDBs, governments, and the private sector. To succeed in this endeavor, the MDBs will have to modify their operational approaches and the internal staff incentive structures. Two channels that MDBs can utilize to augment the role of the private sector are to assist governments in creating conditions for appropriate market-oriented growth, and collaborate with the private sector and increase private capital flows by becoming participant investors. Conversely, to successfully partner with the private sector, the MDBs must improve their expertise in various aspects of international banking, adapt to the flexibility and confidentiality required of private sector operations, and develop a new risk culture and the knowledge base for commercial risk analysis. The comparative advantage of the MDBs in this partnership is that they possess a capital structure that permits them to operate in high-risk environments, and their relationship with developing-country governments enables them to reduce political risks in a manner that the private international financial sector appears unable to do. Governments tend to have more faith in a project when there is a partnership between the private sector and an MDB, which is duty bound to protect its members’ interests. The success of MDB collaboration with the private sector involves judicious design and implementation, as well as the allocation of the intertwined risks (political, regulatory, and commercial). The World Bank Group has pioneered an approach of pursuing private sector solutions for attaining development goals while reserving public finance for critical areas where private sector involvement is not optimal or available. With a view to enhancing its commitment to Maximizing Finance for Development (MFD), the World Bank introduced (in March 2017) the “cascade approach,” a concept that leverages private sector financing and solutions. If public debt and contingent liabilities are limited, then private solutions are promoted, and if not, then the option of public finance is pursued while upholding environmental, social and fiscal standards, and good governance criteria. The cascade approach serves as a complement to domestic resource mobilization and enhances the effectiveness of public finance. MFD dovetails with the WBG private sector arm International Finance Corporation’s (IFC) strategy to “create markets” as well as the World Bank risk guarantee arm Multilateral Investment Guarantee Agency’s 2020 strategy. MFD reinforces regulatory or policy frameworks, champions competition, and develops local capital markets. Operationalization of the cascade approach requires effective cross-WBG coordination and systematic efforts to equip staff with guidance, resources, training, and monitoring to scale up and integrate MFD into World Bank operations and its engagement with clients. The MFD approach has been piloted in nine countries: Cameroon, Cote d’Ivoire, Egypt, Indonesia, Iraq, Jordan, Kenya, Nepal, and Vietnam. The cascade approach, if implemented across all MDBs, will facilitate a paradigm shift in the way the MDBs operate. Often institutional investors’ margins are so thin that the cost of acquiring the knowledge and relevant expertise to analyze and evaluate development projects might render financing development less attractive, if not impossible. Hence, to ensure that institutional investors participate in financing development, the cascade approach needs to be complemented by a mechanism that permits the private financial sector to buy into the portfolio of the MDBs, ex-ante, or prior to the preparation and implementation of the project, and/or ex-post, or after the project has been fully disbursed. This “portfolio approach” is a method through which the MDBs can mobilize and catalyze financial resources from institutional investors. Bankable projects do not emerge out of thin air. MDBs need to scale up the use of the in-house expertise to prepare and implement projects while also transferring this expertise through technical assistance to country governments. Technical assistance can also be provided to the private sector in developing countries (through, for example, advisory services by IFC) to prepare projects that are of interest to foreign investors, be it financial or physical investments. Investments need de-risking for the private sector but also for the public sector. Part of the de-risking will be quality preparation and implementation of projects, but also through proper management of exposure, including contingent liabilities, that are created through the various forms of public-private partnerships. In the cascade approach, these will emerge directly between governments and the private sector. In the portfolio approach, the risks will emerge on the balance sheets of the MDBs. The recent capital increase for IBRD and IFC will greatly assist in this matter. Indeed, developing countries should not underestimate the risks associated with the cascade and portfolio approaches. Thus, the MDBs should actively assist developing countries with project management, including preparation, implementation, and supervision of projects. They should also provide assistance in public investment management and risk management, including guarantees and implications of public private partnerships for debt management. In addition, the MDBs need to take the lead in preparing the classes of assets that can be offered under the portfolio approach to the financial markets. The MDBs must collectively own the 2030 Agenda to mobilize private finance for development, otherwise achieving the SDGs will not be possible. The partnership between the MDBs, governments, and the private sector holds great promise, and if the each of the stakeholders does their part, we move closer to reaching the ambitious SDGs. With increasing data, workloads, and client demands unlike ever before, it is even more critical to make sure you understand how legal technology can give your practice every advantage. In fact, half of law firms do not believe they project a distinct, compelling value that differentiates them from competitors. Don’t let that be you. Use big data and artificial intelligence to build your reputation as an innovator and positively impact your client’s view of your firm. With data-driven litigation analytics on judges, courts, attorneys, law firm, and case types – tailored to your needs – you can quickly assess the case to build the strongest litigation strategy and better manage client expectations. In Big Results With Big Data, you will hear from the Chief Knowledge and Client Value Officer at Shearman & Sterling on how they are leveraging big data and litigation analytics to build a stronger case strategy for better management of client expectations. You will also get the inside scoop from a Product Developer at Thomson Reuters to see how they are doing big data differently to improve your practice. Meredith is an attorney with more than 15 years of knowledge management experience at Baker Donelson in Memphis, Tennessee, where she served as Chief Knowledge Management Officer and as a Knowledge Management Attorney. A widely recognized presenter, author and blogger, she was named one of 2016’s top 10 women in legal technology by the American Bar Association and is the Immediate Past President of the Board of Directors for the International Legal Technology Association (ILTA). In her current role, Meredith leads the firm’s knowledge management, legal project management and other teams that are focused on increasing efficiency and client value through improving access to data and information, streamlining process and technology. Please note: this is a non-CLE session. The post Big Results With Big Data appeared first on Law Technology Today. Throughout the last several years, plenty of new communication apps and platforms have launched under the claim of replacing or “fixing” email. But it’s estimated that nearly 300 billion emails will be sent per day throughout this year. So it seems that email isn’t going anywhere anytime soon. So rather than claiming to be the next alternative to email, Hop is a new communication service that works WITH email. You can create an account with your existing email address and then simply use it as a way to organize your communication and make sending messages easier and more in line with the communication methods of today. Here are some of the reasons why Hop is a solution that might help your business communicate more effectively. As a business owner, you’ve probably already downloaded tons of communication apps and services. And all of those different accounts can be tough to manage. The fact of the matter is, you’re always going to use email. It’s what your colleagues, partners and customers all use. So instead of replacing it, Hop is just looking to improve the experience. 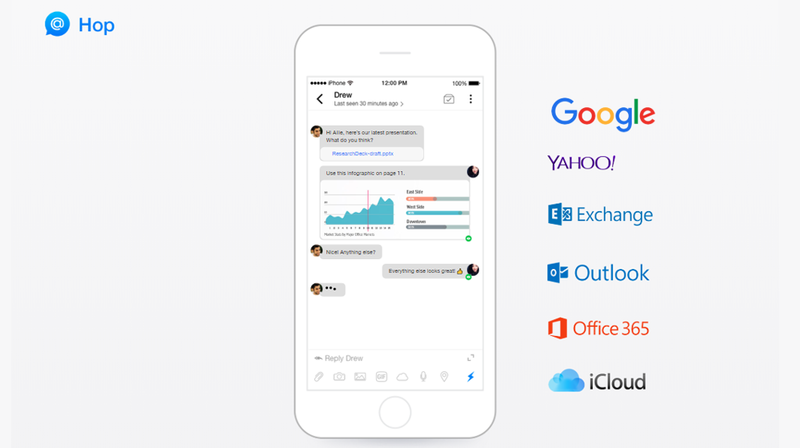 But unlike traditional email, Hop makes group conversations and project management easier. It’s not a project management app like Asana or Trello. But it does allow you to start group threads that you can easily monitor and collaborate on documents and other projects. Other communication apps like Slack and Basecamp offer plenty of intuitive features for team collaboration. But when you’re working with clients or people outside of your company, that communication gets complicated. So Hop allows you to collaborate easily within your email account and then use the same platform when you need to send an email to a client. You won’t need to ask anyone to download a new program in order to communicate with you, since they already have an email address. One of the main benefits of Hop is the way it organizes your email. You can save high priority messages and contacts who you interact with regularly. You can also see your whole message history with a particular person or group quickly, and see all of your relevant files and calendar events along your sidebar for easy access. In addition to the practical features available in Hop, there’s also a layout that makes it seem much more like an instant message or chat platform, along with fun features like gifs and emoji. Currently, Hop is available as a free download in the App Store and Google Play. It’s also in advanced beta in the desktop and web versions. Those who are interested in checking out the web version can sign up here. Multi-generational living is catching on in the U.S. The Pew Research Center shows that 20 percent of the population (64 million Americans) currently live in a multi-generational household. That’s up from 17 percent in 2009 and 19 percent in 2014. The study defines multi-generational living as including two or more adult generations under the same roof, or grandparents and grandchildren younger than 25. Most often, the reasons for living with extended family members center around finances or health, like an adult child moving back in with parents after a job loss, or elderly parents moving in with an adult child because they can’t physically live alone anymore. Bringing generations together under one roof requires a house with the capacity to handle a range of lifestyle demands. Maybe your elderly parents prefer an in-law suite, while your 20-something daughter prefers a private entrance. Maybe you can renovate your home to accommodate everyone, or perhaps you need to buy something new, together. Either way, you’ll all have a lot to consider. Is this living arrangement temporary or permanent? If it’s temporary, consider whether you need to buy a new home or if you could modify your current property. What are the needs of your multi-generational family? Will your 75-year-old father need a ramp instead of front stairs? Will your driveway have to accommodate multiple cars? Will you be cooking and eating together regularly, or do you prefer separate kitchens? How many bedrooms and bathrooms do you need? How will the living space be divided to suit every family member’s needs and privacy? What boundaries will be set to maintain privacy? What is your plan for sharing the financial responsibilities—paying bills, groceries, property taxes, home insurance, maintenance and repairs to the house? Be sure you’re aware of how much every adult member can realistically contribute so you can finalize your budget for a purchasing a new house or undertaking renovations. How will you divide the household chores, like dishes, laundry, trash, mowing? Who will be responsible for caregiving duties for an elderly parent or relative living in your home? Sometimes, renovating is the most effective way to create the living space your family needs. You could update your current home, or look for a new home with an eye toward immediately fixing it up. Before any work starts, you’ll need to confirm that the local and county zoning laws and homeowner’s association regulations, if applicable, will allow you to proceed with the renovations. A contractor might help you with this. If you’re buying with an eye toward renovating immediately, discuss your needs with your realtor. To learn more about how you can renovate your home to fit everyone’s needs, including aging-in-place modifications, the National Association of Home Builders offers a guide on the principles of universal design, which focuses on a design that makes things accessible for the elderly and disabled. Once you’ve hammered out the details of what type of home you need, and if you’re buying a new home, share all that information with your realtor. The more that person knows, the better they can help you find something that works for the whole family. In general, consider homes that have a versatile design. Multifunctional spaces, as opposed to customized rooms, allow for maximum flexibility to accommodate the needs of all family members. For example, a minimally furnished room with built-in shelving could be used as a daytime office for your adult son working from home, a playroom for your child or an exercise room for your father. A house with open access spaces is also important to address the safety needs of the youngest and oldest members of your family. You can keep an eye on everyone, and create paths through the house that are safe for all. Consider focusing your house-hunting on properties with multiple master suites, or an in-law suite with a kitchenette located on the first floor for easy access. For maximum privacy, ask the realtor about the possibility of renovating to allow for a separate entrance to the in-law suite. If you aren’t in a hurry to move in, there may be home builders in your area who offer build-to-suit multi-generational homes. However, simply buying a larger house is not the only solution. This list from The Balance includes a number of alternate residential housing options for greater privacy. Perhaps your family builds two houses on one lot, or purchases a duplex or two condos within the same multi-story building. Because your joint families would still be living separately, this solution works well if your elderly relatives do not require constant care. You might also want to consider a separate-but-together living option if the emotional and psychological aspect of sharing a home might seem difficult. Also, not all of these housing options will be available where you live, and your budget and size requirements will narrow the possibilities further. Location always matters in real estate, but combining generations could add further considerations. If elderly parents are unable to drive but would like to stay active or spend time outdoors, a location near amenities they can access independently will make life easier for everyone. Maybe you’ll need a place near public transport, with access to walking trails, parks, a community center or library, or other recreational spaces. The same goes for adult children, who might be living at home to save money. Cutting back on gas or not having to buy a car could be a priority for them. Similarly, if an elderly parent needs regular medical care, living near a hospital or medical provider, as opposed to facing regular hour-long commutes for treatments, might also be a consideration. If you can’t find a home that fits your needs in your top neighborhood choices, consider buying a home and renovating it. Or consider buying land and building a custom home. A growing number of home builders across the country are offering flexible spaces and multi-generational floor plans, according to the trade magazine Builder. Once you find a home, you’ll likely need to obtain a mortgage. If several members of a family are on the application, creditors take into consideration all applicants’ credit profiles. A loan application should include only those who are applying for the loan, and who can afford to pay it back. However, some multi-gen-friendly financing options are becoming available. For example, FannieMae HomeReady allows home buyers who meet certain income caps to apply for a mortgage using the additional income, but not the low credit score, of extended family members. When it comes to real estate taxes, consult with a tax advisor to discuss how deductions will work if there are multiple people contributing to the mortgage payments. You can also look into tax deductions if you’re caring for an elderly parent who can be considered financially dependent on you. It’s also good practice to confer with your home insurance agent, since most standard policies don’t provide coverage for a combined family household. One of the biggest questions will be whose names go on the deed to the house. The deed is a powerful document that helps determine who owns the property in case of the death someone on the deed. You might want to consult with a financial planner about this. If you are moving in with parents, you may need to sell one or both homes, depending on your plans. Timing is vital — ideally, you wouldn’t sell your current home, or homes, before you’ve closed on something new, but that’s easier said than done. If you are concerned about the logistics of selling or fear you won’t get a good price, you can rent out your current home. It’s time-consuming and can be difficult to sell one house, much less two homes if you’re combining households into something new. Holding on to one house and taking the rental income will help pay the new mortgage. You could also list it for sale while you have tenants, although you should make sure you have the proper rental agreement in place and that the tenants are aware that the house could be sold. Beyond the sales, you’ll also have two households worth of furniture and appliances to contend with. These discussions can get emotional if a parent wants to keep a sofa that doesn’t fit with the adult children’s decor. Selling off some extras might help offset the costs of buying and moving, or sweeten the deal for buyers if you leave them behind. When Keith and Erin Westergaard of Paradise, Nevada, decided to move with Keith’s mom into a more spacious and new home, they didn’t want to get burdened with the whole process of getting their old house ready for sale. They chose to skip the hassle of listing, showings, and months of uncertainty and sell to Opendoor, so they could start enjoying their new home and its sprawling backyard as soon as possible. As you combine households, consider the other details of what everyone will need. Perhaps you need to keep all the TVs and both microwaves and fridges because there will be separate living spaces in the new house. Take the time to discuss these items and also the purchase of any special furniture for young children or medical equipment for elderly parents. The more organized you are, the smoother the move will be. Consider assigning each person specific tasks and responsibilities. You can have weekly or bi-weekly meetings via online chats or in person to discuss progress and address questions. If you’re looking for a way to organize the process online, you can use a free project management app like Trello, so everyone can view, assign and collaborate on the required tasks. No matter what happens, take the time to consult with each other along every step of the way. Consistent and clear communication will be your family’s most effective tool for getting through this long process with the least amount of complications. Creating one big happy family under the same roof will inevitably have its ups and downs, but if everyone is communicating throughout the entire long process, living in multi-generational harmony won’t be so far out of reach. Today we’d like to share another slideshow with you. The idea is to have a bit more of motion when navigating between the slides and showing another preview part with a fullscreen image. The inspiration for the effect comes from Louis Ansa’s beautiful design, “Paradis – Reprise”. The animations are powered by TweenMax. When navigating to the next slide, we cover the current image with a reveal element that’s of the same color like the background of the page. The next image, which is initially covered, will be revealed. We add some translations to the elements to create a bouncy motion. When the details arrow is clicked below the image, we slide the respective fullscreen image with its content up in the same uncovering fashion. We hope you like this little slideshow and find it useful! Motion Reveal Slideshow was written by Mary Lou and published on Codrops. 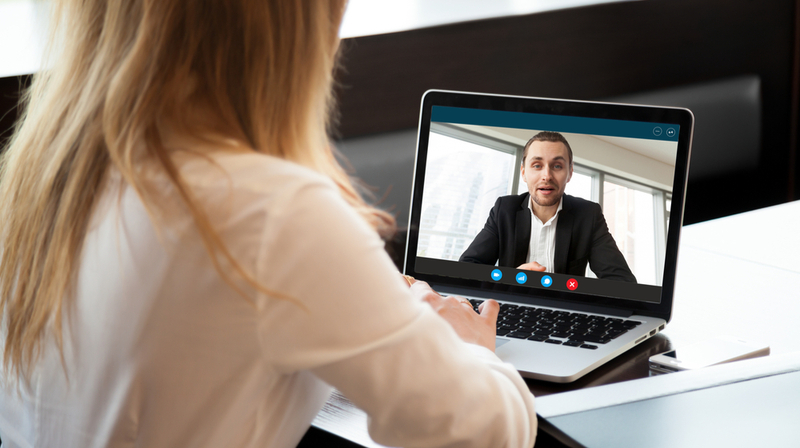 Trend Micro is excited to partner with SPC International in this 5-part Blog, Webinar and Online Training Series; focused on Building a Profitable Security Services Offering for MSP Partners. Through the series, SPC will teach you a selling process of leading with security, steps in growing your recurring managed security services revenue and provide you the tools to make it happen. Security is the number one concern of business owners today. This isn’t surprising, with all of the hacks, breaches, data thefts, ransomware attacks and privacy violations that we hear about on a daily basis. And those are just the ones we know about – according to the Online Trust Alliance’s (OTA) “Cyber Incident & Breach Trends Report,” cybersecurity incidents nearly doubled from about 82,000 in 2016 to 160,000 or so in 2017. But the report also notes that this number could easily be more than double that, as so many breaches are unreported. The necessity to thwart these cybercriminals and protect critical business, financial, healthcare data and more has created a tremendous opportunity for IT service providers to evolve to meet this challenge and benefit from a continually growing revenue stream. In this 5-part blog series and its companion Webinars, I’ll dive deep into the topic of building a profitable security services offering and cover essential topics such as the services that comprise different levels of security offerings; as well as how to lead with security to prospect effectively and set appointments, and how to price, position and sell these services. And once sold, I’ll cover how to properly On-Board new clients and share a strategy to continue to realize healthy ongoing security project profits and exponentially growing recurring managed security services revenues on an ongoing basis. We know that Security is the #1 concern of today’s business owners, regardless of the industry they serve, and strategic leaders understand that they must increase their security posture to protect their data, systems and users against internal and external threats. Therefore, offering IT security services is a strategic client service and control point for security providers. These high value, high margin services represent a stable, growing revenue opportunity with an extremely low barrier to entry and delivery. What are Managed IT Security Services? Managed IT Security Services are a defined set of onsite or remotely-delivered services that are prepaid for at a fixed rate on a recurring basis, where the security provider assumes complete responsibility for the management and delivery of these security services and their outcome. In addition, these services are governed by a Service Level Agreement or SLA, and are scheduled, preventative and proactive. On the other hand, Managed IT Security Services are not measured by time invested. Nor are they reactive services. Finally, they are not billed for on a time and materials basis. The old way of delivering security services to clients means that the service provider is most profitable when their client is in the most pain, as the price of reactive, emergency security remediation services are always higher than scheduled, monitored, preventative services. And clients are never prepared to pay for these reactive, costly emergencies, which negatively impact their cash flow and operations, and in extreme cases, their brand, image and customer relationships, and create tension between them and their reactive security provider. The new way of delivering Managed IT Security Services is much more attractive and beneficial to clients, as the security provider actively seeks out and delivers security solutions to protect their clients’ data and environments from security incidents and manages security risk and response for a flat monthly fee. Because the Managed Security Services Provider; or MSSP, assumes more risk in the relationship, if they are to be profitable, they must ensure their client’s security and reduce vulnerabilities. As a result, the MSSP is more profitable when their clients experience less threats, and their business goals align with their clients’ in this respect. This reality creates a much stronger business partnership than a typical vendor relationship for the MSSP and their clients and paves the way for acceptance as a Trusted Advisor. What comprises a security offering and what are its benefits? A basic security portfolio typically includes Firewall Management, Anti-Virus and Anti-Malware solutions, desktop and server operating system security, Email Security, Web Content or URL Filtering, Mobile Security, Data security including Backups, end-user Security Awareness Training and more. And there are a variety of advantages for a client when engaging an MSSP, including enjoying a high level of confidence that drives continued innovation in their organization, instead of worrying so much about security threats that this concern stifles growth strategies and activities. Along with improving their compliance posture, clients enjoy rapid detection and remediation of threats at much lower costs than reactive, “after the event” security remediation services, and gain a stronger posture to reduce insider fraud and theft, along with guarding against data leakage. In addition, a clear path and process to identify and quickly address security incidents brings clients peace of mind, and predictable monthly fees allow them to budget for security more effectively for the long term. When presented properly to a prospect, these and other factors make a compelling argument to engage in a managed IT security services relationship. To provide the best opportunity to engage with as many prospects as possible while maintaining healthy margins, the MSSP will bundle and tier their services to offer various distinct packages, with each successively higher-priced option adding more qualitative value in terms of services and benefits, along with more attractive Service Level Agreements; or SLAs, that govern response time. This allows prospects to select the option that makes the most sense for their specific business needs, risk profile and budget. There are several considerations for the MSSP when determining their pricing model, and they can price their services in several ways, such as per endpoint, per user or as the aforementioned tiered or bundled services. Or they may price strictly on value alone, with each opportunity quoted individually. Their ultimate pricing strategy will also be informed by other factors, such as their SLAs’ response times and the hours they provide service to their client – 8 to 5 Monday through Friday, 24×7, or on holidays or weekends. Once the appropriate service bundle or tier is selected by the client, the MSSP will provide them a Scope of Work or SOW, that clearly defines what is included and covered in the service relationship, and what is not. Typically, the SOW covers all of the agreed-upon security maintenance and service work the MSSP delivers for the specified endpoints, devices and users within the SLA. New users added, or new services or licenses installed or provisioned after service go-live normally fall outside the scope of an existing SOW, and will typically be added to the client’s overall agreement at an increased monthly fee by having the client authorize a new SOW or an addendum to the existing SOW. And to preserve margins, best in class MSSPs will understand the true cost of delivering their services to their clients; including the cost of 3rd party security products and services they bundle into their offerings and establish a minimum desired margin for these deliverables. Using a pricing calculator helps ensure margin attainment and speeds pricing activities. Once the minimum price is established for a client, the security sales professional will try to increase the ultimate price by using consultative sales techniques to sell on value. A Trusted Advisor is a critical business asset for their clients, as they work to understand their client’s business needs and priorities and develop strategies to actively seek out solutions to improve daily workflows, processes and procedures and improve security to best assist their clients reduce risk and reach their business goals. An effective Trusted Advisor earns their client’s loyalty by understanding their external competitive challenges as well as their internal operational challenges and works to help their clients advance their value proposition to their target market, improve client service, sales, marketing and back-office operational processes through technology to help their clients retain and expand their market base. Co-Founder, Senior Vice President and CIO of MSP University and SPC International Online, Erick Simpson is a strategic IT business transformation specialist that improves top and bottom-line business performance by increasing operational and service efficiencies, helps build and grow new or improve existing MSP and Cloud business practices with proven sales and sales engineering, project management and help desk processes; and packaging, bundling and tiering profitable MRR service offerings. 30+ years of experience in the IT industry as an Enterprise CIO and one of the 1st pure-play MSPs in the industry (acquired in 2007), Erick is a business process improvement expert with hundreds of successful ITSP, MSP, Security and Cloud improvement engagements, and has worked with numerous clients on the buy, sell and integration sides of the M&A process. The post Building a Profitable Security Services Offering Part 2 IT Security Features and Benefits Overview appeared first on . One major theme in the books, articles, and blog posts about organization is decluttering. It’s out with the old and ditch the unuseful, and in with the new and keep the highly useful. When you start thinking about decluttering and organizing at work, it’s helpful to think about organizing three different spaces: physical space, mental space, and digital space. This article will point you toward a few ideas and resources that can help you to declutter and organize your worklife in all three areas and increase your productivity. Remember: worklife organization is intensely personal, so there is no “right way” to do it. In order to be successful, you’ll likely have to try out a few ideas and tweak them to work best for you and your work environment. Yep, the tried and true to-do list still reigns supreme to declutter and organize your worklife. According to a recent episode of the podcast Hidden Brain, to-do lists are actually responsible for saving lives too! But writing down a simple, column list is not always enough when projects start multiplying. I like to have a macro list of all my projects that I break out into daily to-do lists every morning. This helps create to-do lists that I can accomplish in one day. Bullet journaling creatively helps my worklife organization exist in one place. I don’t keep track of my calendar or daily to-do lists in my journal, instead I write ideas, thoughts, research, and resources for each project; plus I keep them simply but well-indexed for easy reference. My pages often end up looking like little brainstorms that are easily fleshed out into full-fledged projects. There are many ways to personalize a bullet journal for high productivity, and you can learn more about how they work here. As a costume designer and theater professor, my friend La may have up to four plays she’s in the process of designing while teaching several classes — that’s a lot of project management! To keep track of each class and show, she color codes all her physical and digital materials. This includes sticky notes, highlighters, pens, folders, and more. It even includes color coding each class in her grading and attendance apps. If you’re tired of lifting up piles of paper on your desk to find the right piles of paper, it’s time to start thinking about a desk declutter. Of course you don’t have to go full minimalist for your desk. Some of the philosophies and tips Becoming Minimalist states in this article can help you figure out what will work best for you. Once you get in the habit, it may only take you 5 to 10 minutes a day to keep it tidy. Remember to include decluttering your computer desktop too! Guided meditation via a mobile app is a great to help you focus energy on clearing specific mental blockers (AKA mental clutter) such as managing stress and workplace pressure, according to the Huffington Post. To help you find the right meditation app for you, check out this article from Healthline for a breakdown of the highest rated apps. I use and like Calm. When it’s time to declutter team stress and bring everyone closer together, organize a team building event! Contact us via our website at fireflyteamevents.com, phone at 877.267.1939, or email james@fireflyteamevents.com. The post Worklife Organization Tips to Help You Declutter For Good appeared first on Orange County & Los Angeles Team Building. Freelancing is an attractive way of life. The independence, autonomy, flexibility, and unlimited financial potential are all incredibly inviting, especially for employees who are tired of their mundane work environment. But, there’s still some mystery surrounding the enigmatic career choice. As a freelancer, how do you make money? Where do you find work or jobs? How do you figure out what to do? What about insurance and benefits? These questions are what typically stop people from pursuing a full-time freelance career. And these questions are the ones we’ll answer in this guide. I was a freelancer before joining HubSpot — AKA the best career decision I’ve ever made. Starting my freelance business was a very intentional choice made in the midst of working a very unfavorable job. Freelancing was the most difficult 18 months of my life, but it completely rerouted my profession and led me to where I am today. It was more than worth it to take the leap into the unknown and pave my own career path. Whether freelancing is your lifelong dream or a means to an end, we’re going to walk through each element of starting your own business, making your own schedule, and managing your own clients. By the end of this guide, you’ll know exactly what’s expected of you as a freelancer. Self-Evaluation: Is Freelancing for You? Before moving forward, let’s take a breather and do a little self-analysis. Is freelancing right for you? If so, what work would you do as a freelancer? What would your niche be? Here are a few questions to ask yourself to evaluate whether or not you’re ready for a freelance career. Why do you want to freelance? Are you looking for a more flexible schedule, or are you merely trying to escape your dreaded commute? Do you want to expand your professional horizon, or are you simply bored at work? You might’ve heard it before, but the grass isn’t always greener on the other side. Pursuing freelancing for the wrong reasons will make it hard to keep going when the going gets tough. Can you afford to freelance? A freelance career holds the promise of a higher salary and unlimited income potential. After all, as a freelancer, you’re the one deciding what you make and when you make it. But you’ll likely not see that income right away. The first few months (or years) of freelancing typically involves sacrificing income while setting up your business, establishing yourself, and finding clients. Are you comfortable with being uncomfortable? Freelancing can be majorly uncomfortable. You won’t always know where your next paycheck is coming from, you’ll probably be rejected more times than you can count, and you’ll definitely experience a few days where you think, “Why the heck did I do this? That commute doesn’t sound too bad right about now!” All of these thoughts and feelings are normal; I’ve always referred to them as growing pains. After all, if it’s not challenging you, it’s not changing you. Next, let’s talk about what kind of work you’d do as a freelancer. This step is another common roadblock for folks who want to freelance … they’re simply not sure what to do. The answer is simple, though. It might just take a couple questions to draw it out. What are you good at? This five-word question can determine a lot for you. What are you skilled at? What do others ask you to do for them? Notice that I didn’t ask, “What are you an expert at?” Experts are few and far between — all you need to decide right now is at what you’re willing to become an expert. What brings you joy? This question isn’t always applicable. There will be days and times that you simply don’t want to work or might be sick of your chosen field. That’s life. But, above all, there’s usually one skill set or profession that brings you joy. What makes you feel good to accomplish? What are you proud to share with friends and family? This is probably what you’ll excel at as a freelancer. Now, let’s pull the spotlight back and look at freelancing as a whole. Regardless of fit or type of work, there are definite benefits and drawbacks to a career as a freelancer. Let’s look at a few. You’re the boss. You choose your schedule, rates, and which clients or jobs you want to take. If you feel like working in your pajamas, you can. If you want to take a three-week vacation, you can — it’s completely up to you. You could pay less in taxes. Freelancers can take advantage of more tax deductions on meals, travel, and more. Federal and state taxes aren’t withheld from each paycheck. Freelancers pay the IRS directly, instead. You (can) make more money. Freelancing is high risk, high reward. Your salary is whatever you want it to be. It all comes down to how much you charge and how often you want to work. You have a better work-life balance. Instead of commuting every day, you can simply stroll to your neighborhood coffee shop. Instead of rushing to the gym over your lunch break, you can take an hour to workout whenever you want. When freelancing, you can work whenever you want and live wherever you want … it doesn’t have to resemble a typical 9-to-5. You’re the boss. You have to make all the decisions and do all the work, from bookkeeping to managing cash flow to selling your services. You’re not simply an employee of a business; you are the business. You have to organize your own benefits, taxes, and accounting. Freelancers don’t have employers to manage and provide benefits, taxes, and the like. They have to do it themselves with the help of tools or guides, like this one. Also, purchasing your own insurance is typically more expensive than through a traditional employer. If you don’t work, you don’t make money. Sure, you can take a three-week vacation, but you won’t make any money while you’re gone. As a freelancer, your time is quite literally money. Spend it un-wisely, and you could be giving up valuable income. Instability can interrupt your work-life balance. There are a lot of unknowns with freelancing, the biggest being where your next paycheck might come from. This instability can cancel out any work-life balance achieved through freelancing. For some, having stability and predictability in your career is worth a long commute or unfavorable schedule. According to an UpWork study, the biggest drivers to freelance are flexibility, freedom, and earning potential, and the biggest barriers are income predictability, finding work, and benefits. If these things are motivating or demotivating you, you’re not alone. In the following sections, we’ll touch on everything you need to know to start a freelance career, from branding to clients to making and managing your money. We want to minimize the unknowns and equip you with plenty of knowledge as you pursue freelancing. The information and recommendations in this article were collected from real freelancers across the world (including some from HubSpot employees who previously freelanced). I’ve also included real anecdotes and examples that will shed some light on what it’s actually like to be self-employed. Any pressing questions you might have about becoming a freelancer? Consider them answered. Before you dive into completing jobs and making money, you need to set up your business. You need to know exactly what you’re doing and how you’re branding yourself. This will not only attract clients, but it’ll also provide direction when you feel stumped or at a loss for why you’re freelancing. Here are a few things you should know to make sure your freelance business survives in the long-run. A personal brand is valuable when establishing authority as a freelancer and creating a long-lasting impression with clients. Whether you use a design tool like Canva or outsource your branding to an agency, personal branding should be one of the first things on your to-do list. Along with a memorable logo, your personal brand should also include a business name. You can brand your business after your own name or a third-party name. Another element of your personal brand is your online identity. This typically includes a dedicated website and social media accounts where you can display your logo and business name, portfolio, testimonials, and services. Nowadays, every freelancer should have a website, especially if they work with clients remotely. It’s good practice to match your website domain and social media handles to the name of your business. For example, if you were a freelance photographer, and your business was named Phoebe Photography, your website could be phoebephotography.com and social media handles could be @phoebephotography. Congruity makes it easier for potential clients to search and find you online. As for a website, platforms like Squarespace, WordPress, and Wix make it easier than ever to create and design a professional-looking site. These platforms also offer templates that you can use to display your work, like writing or design samples. If you opt out of a dedicated portfolio site (which we’ll discuss below), these themes make it easy to integrate your sampled works into your website. Your social media accounts should also reflect your personal branding. Every platform has its own benefits and purpose, so don’t fret that you’ll need to be active on all of them. Twitter is good for sharing your portfolio and connecting with peers and potential clients. LinkedIn is great for publishing a live resume and making valuable professional connections. Facebook is handy for joining groups of like-minded people, and Instagram is valuable for publishing pieces of your portfolio — if you dabble in visual work, like photography or design. There are other places that should reflect your personal brand, too. If you do local work or attend network events, business cards are a great tool to carry with you. Sites like Vistaprint or Moo help you easily create gorgeous print material. Your brand should also be on your proposals, invoices, contracts, and any other materials that go to clients. Why is personal branding so important? A clean, consistent brand communicates authority and professionalism to anyone looking at your business and will help you establish yourself as a trustworthy freelancer. Whether you’re a freelance writer, designer, or web developer, a portfolio of your work speaks volumes to potential clients. Strong copy and testimonials can help sell your services, but portfolios feature your work in action, helping your clients envision your skills working for them. Portfolios also save you precious time by weeding out bad-fit clients before they book an initial call. Should you include all your work in your portfolio? No. The work in your portfolio should be your very best and show diversity in your skills and clientele. So, you’ve got a brand and a book of work to show potential clients. What else do you need to legitimize your business? Keep reading to learn more about establishing your business and setting yourself up for success. Freelancers have some flexibility around the legal and financial structure of their business. Some freelancers remain sole proprietors and opt to receive 1099s and work from a personal bank account. Others register their business as an LLC to open a bank account and further protect their assets. The decision is completely up to you. The only difference is that registering your business will likely cost you a fee. This article by UpWork dives into the specifics of how and why to register your freelance business as a Limited Liability Company (LLC). You’re set up online, now where are you going to set up to work? Your physical workspace can massively impact your productivity, focus, and motivation, so you should keep this top-of-mind when considering your jump to freelancing. Many freelancers choose to work out of their homes, whether for convenience, cost, or to be closer to family. A home office is ideal for work-life balance, but the dinner table, bed, and couch are also options. This article from Contently dives into how to create a home office that works. If it’s not realistic for you to work at home, don’t fret. Today’s working environments are fortunately much more conducive to remote and freelance workers. Between coworking spaces, coffee shops, and public libraries, freelancers of all kinds can find makeshift workplaces outside the house, even if just for the day. If you’re interested in co-working space, WeWork is a very popular choice for remote workers and freelance workers alike. Many cities have local co-working spaces that allow you to leverage shared desks, studios, and kitchens as well as network with other creatives and potential clients. If you don’t have the budget for co-working space, Google your nearest coffee shop, cafe, or university library. Whatever space you choose, ensure it’s free of distractions and provides favorable work conditions. You’ve established the foundation of your business in the form of a website, portfolio, and workspace. Now this section will equip you to build the bones of your business — setting rates and getting work. This is perhaps the most important section in this guide and will provide insight into ensuring you become a successful and impactful freelancer in your chosen field. The process of setting rates and determining fees is perhaps the hardest part of freelancing. Not only can it be awkward to talk about money, but setting rates for your services is essentially putting a dollar sign on your forehead. What are you worth? What if your clients don’t agree? Setting and negotiating rates can feel very personal, but the key to discussing money comfortably is to take feelings and opinions out of it. Instead, use an economic approach to determine your rates, similar to how a business owner might price their products. Do you think they feel bad when they quote their prices? No, and you shouldn’t either. Here are a few popular strategies freelancers use to set their rates. You can also use a combination of the three. Cost-plus pricing is determining how much it’ll cost you to complete a project and tacking on 10-30% as profit. This pricing model is best for artists and freelancers who use physical material and know the cost of completing a project or service. For writers, designers, and developers, this model might be tough to calculate, unless you’re counting your time as the primary cost. Another pricing approach is to base your rates on what you believe your work is worth. This means that your pricing will differ slightly depending on what client you’re working with and what kind of work you’re creating. For example, creating a commercial for a Fortune 500 company will hold a little more value than that for a local coffee shop, right? Right, so you’d likely charge more for the former. Now, that’s not to say one company has more value than the other; you’re just taking into consideration what they can afford and the overall impact of your project. At what frequency should I charge? Some freelancers charge by the hour, where some charge per project (or per word for writers). This decision should be based on the type of work you’re doing and what you’re most comfortable with. Hourly fees ensure you’re paid for all of your time, where a fixed price guarantees you’ll make a specific amount. Also, being paid by the hour puts emphasis on the value of your time, whereas fixed pricing puts more emphasis on the value you’re delivering your client. If you don’t feel like tracking your hours (since clients will likely want to see a timesheet), you could set a fixed price based on how long you think a project might take you. Should I publish my prices on my website? Again, this comes down to what you’re most comfortable with. Some freelancers opt to publish their prices to create a perception around their overall value. It also helps weed out bad-fit clients who can’t afford your services to begin with. Other freelancers withhold that information in order to get clients on the phone. Keeping your prices private also allows you to change prices when need-be. When you start your freelance career, the majority of your day-to-day will involve looking for jobs and marketing yourself. Until you establish your skills and services and become well-known by clients, you’ll need to put a ton of work into applying to gigs, reaching out to potential clients, and simply getting your name out there. When seeking freelance work, the first thing you should do is establish profiles on common freelance job sites. Not only does this give you access to open jobs and projects posted by clients, but it also bolsters your name and business name’s SEO by giving you another link to your website. Join some industry or location-specific freelance communities. This will help you create a network of “colleagues” and freelancer friends as well as expose you to open gigs and potential clients. It might seem counterintuitive to make nice with your competition, but it can actually help your business. In fact, three out of my first five jobs were passed on from another freelancer who couldn’t complete them all herself. For a bolder, more direct approach, consider reaching out to managers, directors, and editors at the companies you’d want to work with. Simply communicating your availability and sharing your website keeps you top-of-mind when work does arise. Connecting directly also shows clients that you’re proactive and take initiative when needed. Lastly, the best way to consistently attract work is to market yourself and your services. Marketing yourself extends beyond applying for specific gigs or reaching out to clients. It’s more so promoting your business as a whole and establishing a presence on social media, publications, search engines, and more. Most of this work happens with little to no pay but more than pays off in the long-run. Here are some strategies to market yourself and attract more work. Inform your friends, family, and professional network of your freelance business. Even if they don’t need a freelancer, your name might come to mind if they’re asked if they know someone. The more people who know about your business, the more people who can potentially refer you. Stay active on social media. Follow and connect with freelancers, influencers, and potential clients on Twitter and LinkedIn. Engage with their posts by asking questions or sharing content with your network. I personally know of multiple freelancers who landed work by engaging with a certain editor or project manager who simply liked what they had to say on social media. Work for free. If you’re a writer, pitch articles to publications like Entrepreneur, Fast Company, or Inc. to build your portfolio and get bylines. If you’re a designer, offer your work to a non-profit for free to create goodwill and associate your work with a real client. Establish authority in your niche. Attend industry events (like INBOUND! ), teach a local course, or lead a seminar or webinar. One freelancer I know tutors writing students at her local library. Will any of her high-school-aged clients hire her? Probably not, but it still builds awareness of her business while helping others and challenging her to fine-tune her skills. Ask for referrals and testimonials. Reviews don’t have to come from paying clients. Anyone in your personal or professional network you’ve worked with can testify to your skills and work ethic. Consider professors, past employers or colleagues, or mentors. Ask for reviews on LinkedIn and copy them to your website. Say yes! As you establish yourself as a freelancer, keep your mind open to new opportunities. You never know what could lead to a client or job! Freelancing means that you’re in charge. You create your schedule, you set your deadlines, and you pick up the slack when things go wrong. The best way to prevent problems (and impress your clients while you’re at it) is to have a solid project management process in place. Not only will this help you approach each project with assurance and organization, but it’ll also communicate professionalism to your clients. The first step to managing your projects with ease is establishing a place to record deadlines, meetings, events, and important dates. This could be on your Google Calendar, iCal, or even a paper planner. There’s no right or wrong answer here — you should choose what works best for you. Lastly, figure out how you’d like to communicate project information and updates to your clients. (As for how often you’ll communicate with them, that’s also up to you and will likely take some time and practice to figure out.) Remember, as a freelancer you not only need to create amazing work but also please your clients, as clients lead to referrals … which lead to more work! I’ve compiled a list of tips for working with clients below. Set expectations early. From the moment you begin working with a new client, ensure no question goes unanswered. Be proactive in setting expectations for projects, your personal availability, deadlines, and payment. If you feel like you’re providing too much information, you’re likely providing just enough. Put it on paper. Whether you’re connecting with clients over email, phone, or Slack, ensure all decisions and expectations are reflected in official documents. This includes proposals, contracts, and invoices. Doing so creates legitimacy for your freelance business and creates official documentation if things go awry. Watch out for client “red flags.” If a client starts asking questions about availability and payment that make you uncomfortable, listen to your instincts and consider whether or not you want to work with them. It’s OK to say no. Questions like “Will you be available any time I call?” or “If I don’t like it, do I still have to pay?” are examples of red flags and might mean that client isn’t a good fit for your business. Money, money, money. We all need it, but not everyone has to manage it as meticulously as freelancers do. When you run your own business, you must have a hand in everything, from how you invoice to what tools are managing your money. And when it comes to money, setting your rates is merely half the battle. The other half involves billing, getting paid, and managing your freelancing financials. The process of billing and receiving money can be uncomfortable, but getting paid is quite literally what keeps your business alive and allows you to maintain your freelance lifestyle. Thankfully, technology has made it easier than ever for today’s independent workers to manage their financials within a single platform. These tools can help you upgrade from the old school word-processor-plus-spreadsheet system and build gorgeous invoices, process payment in multiple ways (by bank card, direct deposit, etc. ), include any necessary taxes and fees, and even handle reminders for clients who are delayed in payment. Let’s take a moment and dive into invoicing and billing. One important thing to acknowledge about freelancing is that sometimes clients don’t want to pay (or they don’t pay at all). There are some measures that can help if this happens, but there are also some invoicing best practices that you can follow to minimize this risk overall. Bill at least half up front. It’s not uncommon to ask for at least 50% down before starting work. This is a show of good faith from your client and also provides some funding up front so you can get to work. Be crystal clear on your invoice. Spell out all your pricing, due dates, and payment terms on your invoice. Leave nothing to chance. You never know when a client will try to wiggle out of what they owe you. Bill promptly, based on your terms. If you say you’re going to bill weekly, bill weekly. If you say you’re going to bill five days post-project, then do so. Be true to your word. It shows professionalism and trustworthiness, and it keeps your clients from silently backing out of what they owe. As attractive and enticing as the freelance lifestyle seems, it can be equally as complicated. Working for an employer might mean long, boring hours and commutes, but they also take care of a lot of stuff behind the scenes — including taxes, benefits, and retirement funds. And these are things you cannot take for granted. Thankfully, freelancers can set up and manage their own benefits and taxes, but it does take a little extra research and work. We’ve spelled out the need-to-know details below. Everyone loves tax season, right? Well, if you’ve been used to a big return each April, it’s time you change your expectations of tax season. Since freelancers don’t pay taxes with each invoice or paycheck, they’re expected to pay in full each tax season. This can mean thousands and thousands out-of-pocket, which can really mess up your cash flow if you’re not careful. This is one of the necessary evils of the freelance lifestyle. Thankfully, there are a few steps you can take throughout the year to lessen the impact of tax season on your freelance business. Stash away 30% of each paycheck. Whether you set up a business savings account or literally withdraw cash, it’s good practice to “pretend” like taxes are being removed from each invoice you receive, similar to how an employer would do so. 30% might seem steep, but it’ll help you be prepared for taxes and have some extra savings for large business expenses. Pay quarterly taxes. Instead of paying one large sum each April, pay an estimated tax amount each quarter. This relieves your bank account of a massive withdrawal and helps you avoid any late fees or potential interest payments. Save every receipt and research applicable expenses. Expenses can quite literally save you at tax time. Self-employed folks can write off anything and everything to do with your business, like Wi-Fi, rent for the square footage of your home office, mileage to client meetings, and 50% of business-related meals. Be sure to save all records of expenses in case you get audited. Hire an accountant. Freelancing is an incredibly independent undertaking, but you don’t have to do everything alone. If you’re not a tax expert (which most of us aren’t), don’t be afraid to hire a tax accountant to help you better understand your responsibilities. There are plenty of accountants that specialize in self-employed taxes, and these folks can help you find new expense opportunities, manage your funds, and prepare for any audits. Another sacrifice of freelancing is forgoing company-sponsored benefits. And let me be the first to say that those are super important, especially for folks with families and chronic health issues. If benefits and insurance pose a major question of whether the freelance lifestyle is right for you, you’re not alone. If you have a spouse or domestic partner, take a look at their insurance options. This is the most ideal avenue as company-sponsored benefits are usually less expensive than direct options through insurance providers. Even if your partner has to pay a little more to upgrade to an employee plus partner or employee plus family plan, it’s worth it. If you don’t have a partner or he or she doesn’t have the option to include you in their benefits package, don’t fret. There are some insurance plans and providers that cater to freelancers and self-employed people, such as the Affordable Care Act’s SHOP coverage. Organizations like Freelancers’ Union also organize health insurance resources to make any research and decisions less intimidating. If you’re leaving a full-time job, you might be able to tap into the Consolidated Omnibus Budget Reconciliation Act (COBRA), which allows you to keep your health insurance for up to 18 months after employment ends. You’d have to pay 100% of the premiums (including your former employer’s share), but this option might buy you some time until you make a permanent decision regarding benefits. Retirement planning isn’t reserved for the “officially” employed, and you definitely don’t need an employer to set up a 401(k) or IRA. Freelancers and self-employed folks have many of the same options as those who work for a company, such as the Roth IRA, SEP IRA, or self-employed 401(k). This article by Fidelity breaks down which account might be best for you and how to get started. As a freelancer, I started a Roth IRA and set up direct deposits into the account. I did this directly through my personal wealth manager, but there are plenty of tools and platforms that can help you. Regardless of how you plan to invest in retirement, always start as early as possible and stay consistent with your deposits. Your future self will thank you. Freelancing is a lonely career choice. In fact, when I talked in-depth with over 20 freelancers, most of them said the most difficult part of being a freelancer is how lonely and isolating it can be. But this shouldn’t stop you from pursuing a freelance career — it should simply prepare you to put in a little more work socially. As a freelancer, since you’re not going into an office anymore, you’ll likely find yourself spending more and more time alone. You might also find that you talk to yourself more often … or that may just be me. Regardless, freelancing requires stepping outside your comfort zone and working hard to build relationships and joining communities — just like you’d do at work. Meeting others can help you not only stay connected and up-to-date on new jobs and freelancing trends but also refine your skills and learn new ones. Here are a few ways you can stay connected and keep learning as a freelancer. Taking an online course is a fantastic way to inexpensively master a new skill while being exposed to a new network of people. Better yet, some courses are free, and some allow you to become certified so you can increase your credibility. Online courses are a great asset to a budding freelance business and are much, much more manageable than going back to college. Along with these courses, you can also check out dedicated course websites. Platforms like Udemy, Lynda.com, and Treehouse provide hundreds of free and paid courses that cover a multitude of topics and specialties. When I started freelancing in October of 2016, hiring a mentor was the very best thing I did for my business. I didn’t need help writing — I needed help figuring out how to write for other people … and make money doing it. My mentor showed me exactly how to be a freelancer, including how to find business, pitch myself, set my rates, and more. Without her, I wouldn’t have started out so strongly with my freelance business. Not only did she equip me with all the tools and confidence I needed to dive in, but she also passed along a few jobs that she couldn’t take herself. The process of hiring a mentor, coach, or consultant isn’t the same for everyone. Depending on your budget, industry, expertise, and location, you might fare better with a coaching course or a local consultant. Some of the above-mentioned courses teach how to freelance, too. Whether you’re working from the heart of New York City or middle-of-nowhere New Mexico, today’s technology makes it incredibly easy to stay connected to other freelancers. From social media to dedicated forums, there are plenty of ways to join communities, build a network, and make friends. Sites like Freelancers Union and American Writers and Artists Inc. offer memberships that provide resources and access to elite communities of freelancers and creatives around the world. As for social media, there are plenty of freelancer Facebook groups you can join and engage with. Some groups provide work, while others simply provide a place to chat and ask questions. If you’re on Slack, you can also hop into a Freelancer slack community, such as Digital Freelancer. Lastly, don’t shy away from your local freelance network. Nothing quite beats a face-to-face meeting or conversation over a cup of coffee. Organizations like Creative Mornings or local co-working spaces put on networking events and get-togethers that allow you to meet other freelancers in your area. These opportunities provide human interaction in an otherwise majorly digital lifestyle. This ultimate guide to freelancing is long for a reason — there’s a lot that goes into this massive career move. But that’s not to say you shouldn’t or can’t do it. In fact, freelancing is a pretty straightforward process. After addressing any questions and concerns regarding how to establish your personal brand, where to work, where to find jobs, and how to stay connected, the only unknown that remains should be: Are you willing to take the leap?